Using more suspension ropes gives the Colombian hammocks a larger canvas surface to lie on. The weight is being distributed better along the ropes which results in optimal relaxing comfort. Moreover, the ropes are not fixed onto the hammock, but originate directly out of the hammock itself. Thus, the hammock gets its specific extra Tropilex look and there is up to 30% less chance that the ropes will snap. 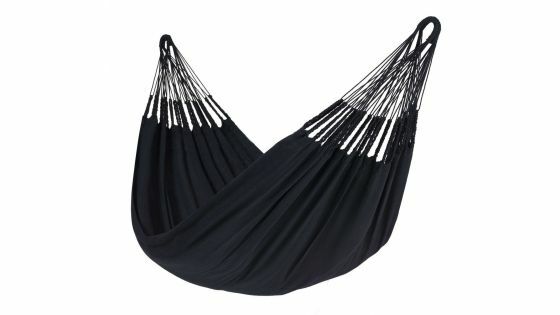 The fabric of this hammock is made from 70% cotton, 30% polyester and is up to 20% thicker than other brands! The cotton combined with the special patterns gives the hammock the ultimate soft character. At the same time the polyester yarns ensure that the cotton gets not stretched too much. These hammocks can handle a rain shower. However, we do advise you to keep the hammock dry if not in use. The canvas is woven up to 20% more tight compared to other hammocks. This provides extra comfort and makes the hammock extra sturdy. The suspension loop is open (Open-Loop) which makes it easy to hang the hammock everywhere. The surface of the canvas is in general also larger than other brands. This without the total length of the hammock becoming longer. The dimensions of the lying surface are therefore completely adapted to the average height of European people. The fabric is woven on special machines for the best result. Error margins are nil, and the quality is guaranteed. Then the real craftsmanship begins. The large canvas is first carefully cut to size. Instead of sewing the suspension ropes onto the hammock, both ends are first loosened by average 30 cm and then braided into cords. The suspension ropes are hand knotted to these cords, also called 'cadejo'. The cadejo gives the hammock the handmade 'look' it deserves, but above all extra strength and the hammock will unfold easier as well. Each hammock from Tropilex comes with a matching bag. You can use this bag to store the hammock. The bag of the hammocks without spreader bar can even be used as a nice shopper! Tropilex hammocks are made in Colombia. Colombia is the perfect hammock country! By paying a fair price for the hammocks and supervising the working conditions, each Tropilex hammock contributes to the prosperity of this growing developing region. In short ... do not hesitate any longer and choose a Colombian hammock from Tropilex!